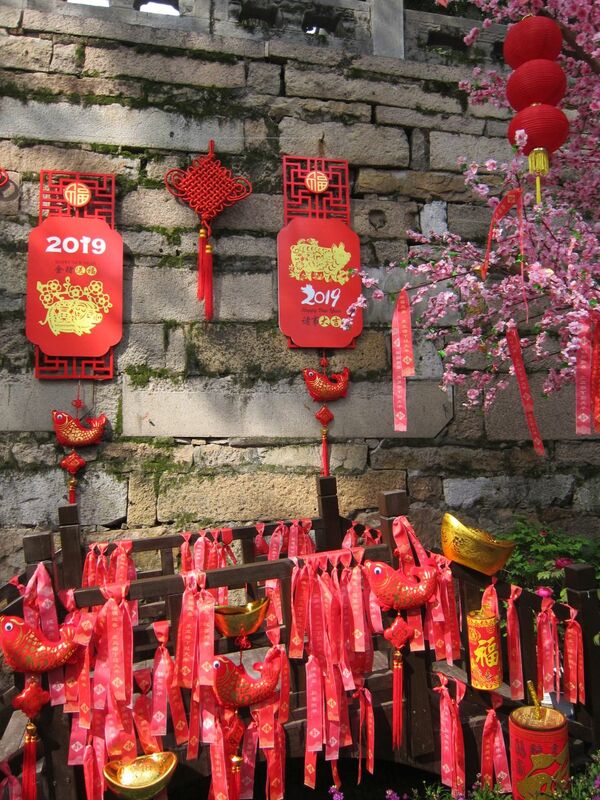 And, just like that, the Chinese New Year holidays are over! 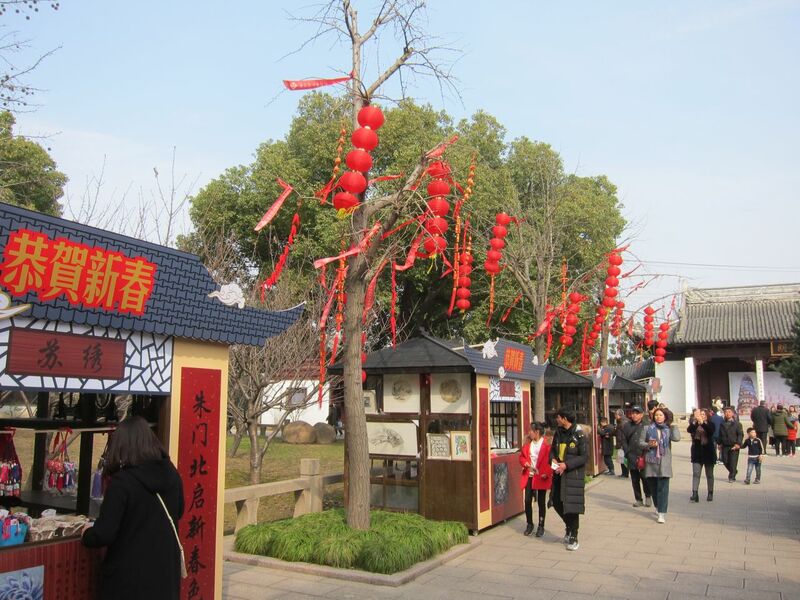 As I mentioned in my previous post, this was the first time I spent this holiday in Suzhou. Chinese New Year has a reputation for being a week in which you basically just eat, eat, eat, watch tv and then eat some more, but we managed to do more things and didn’t even eat an exaggerated amount. We did have a dinner with my MIL’s side of the family in which Baby A. was the absolute star, as the only other grandchild in the family is already 11 years old and oh boy do Chinese people like babies. He was passed around the uncles, aunties and cousins and he was all smiles and happiness, so everybody was charmed. 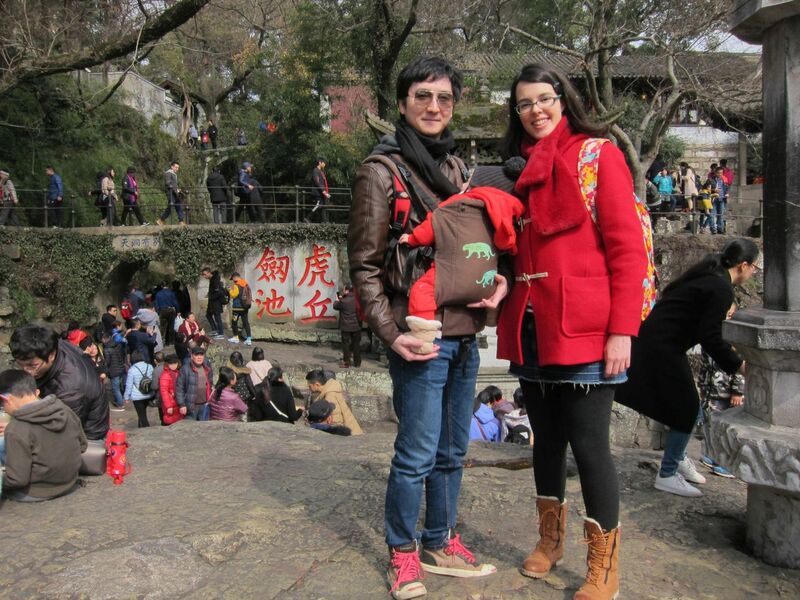 I was asked if all foreign babies are this well behaved, because Chinese babies are usually not. Sorry, I have no idea as I haven’t met many other babies. Maybe he’s just very sociable (he must have got that from his dad, definitely not from me). For Chinese New Year’s eve we had dinner at home with C.’s parents so it was a quiet night. I didn’t even watch the Spring Gala as I find it terribly boring, especially the supposedly comical sketches. 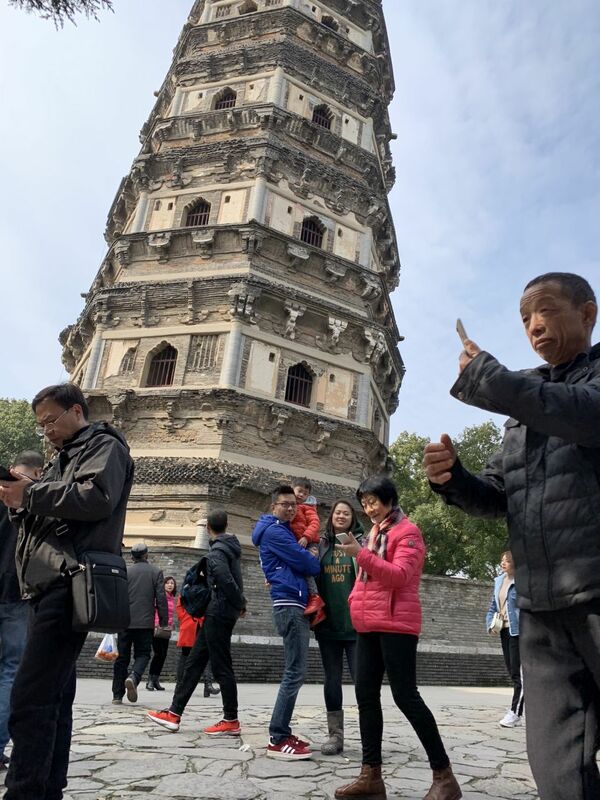 We had planned to go to a lake in the outskirts of Suzhou where it is allowed to throw firecrackers and fireworks (as it’s not allowed inside the city), but the baby had a bit of a cough so I stayed home with him and C. went with his friends. Little did I know this was to be the start of Our First Family Cold as the three of us ended up getting it, and yours truly is currently typing with a very stuffy nose and a bad cough. We went to see the temple fair in Tiger Hill, and although it was not as exciting as I was expecting, it was nice to go and see it. Also, the air quality was acceptable almost every day of the holidays so that helped to lift my spirits too. 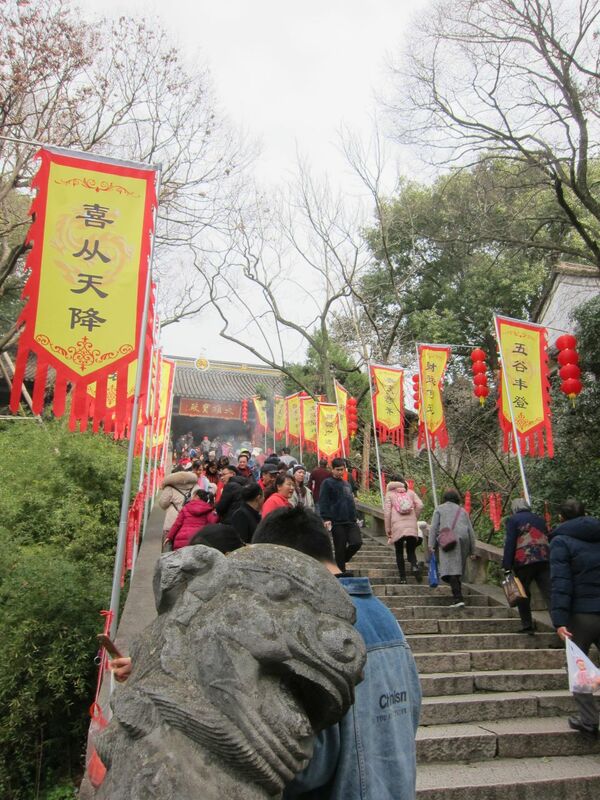 I wanted to see the lion dances in Tiger Hill but we didn’t know what time they were and we missed them. Oh well. Next year it might be easier to just go to a mall as they are usually also performed there. The pagoda on top of Tiger Hill. 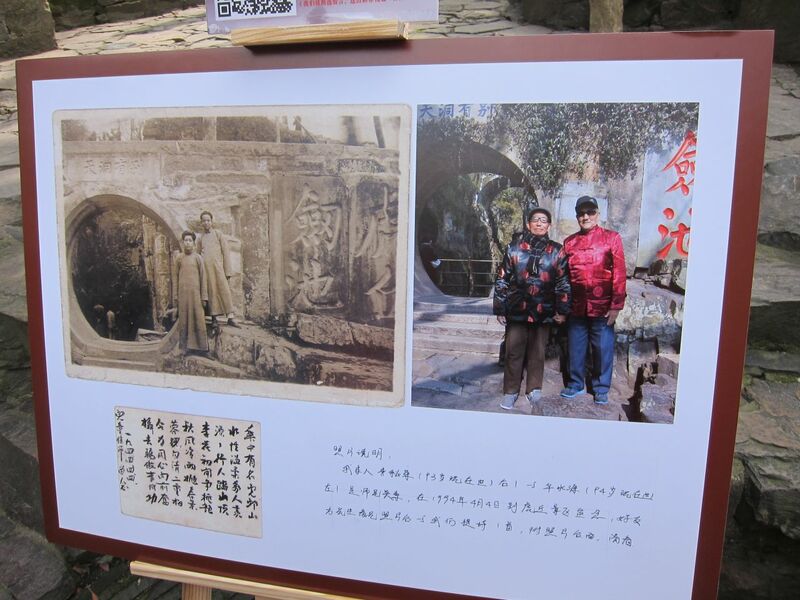 There was an exhibition of old pictures taken in Tiger Hill. In this one, two friends had their photo taken in 1944 and now, when they are over 90 years old. 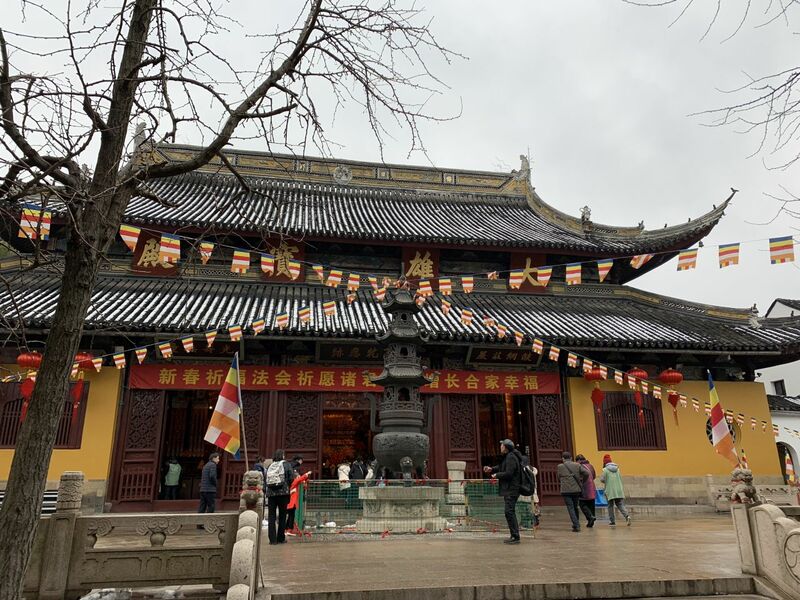 Another day we went to Xiyuan, a Buddhist temple on the west side of Suzhou where local people go during CNY to pray and burn incenses. The night before it had snowed so it was very cold. 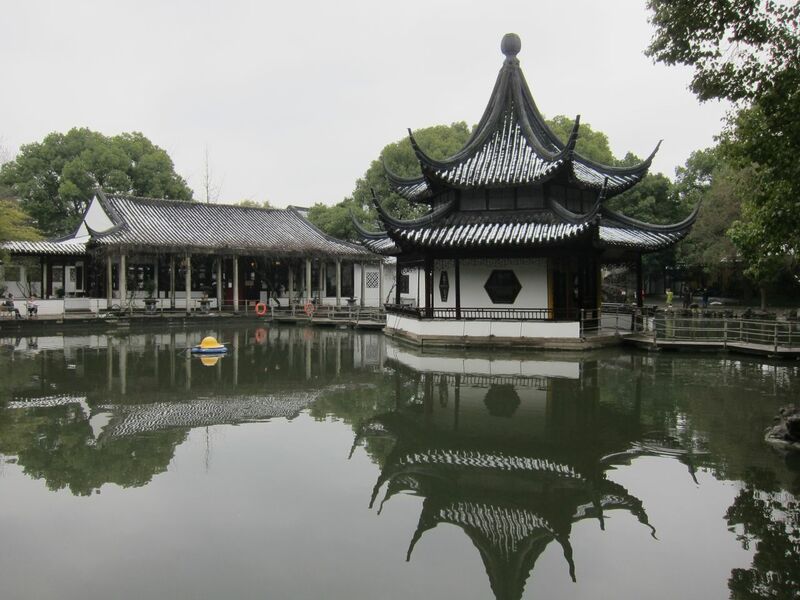 The temple has two very famous attractions, one is a hall with 500 different statues of arhats and the other is the pond in the back garden in which supposedly two giant soft shell turtles live (however, according to Wikipedia, one died in 2007 at the venerable age of 400 years and the other has disappeared). The pond where the giant turtles live(d). So enjoyed this post, love the family photo! So the holidays are officially over? It’s time to take down my flag and lanterns? Do you think the one child policy has something to do with all the baby adoration? Because in the U.S., old people are likely to scowl and complain about babies in restaurants. I’m not sure if it’s because of the one child policy (it probably is, at least partly) but people here LOVE babies so much. As in, waitresses wanting to hold and play with your child, random people in the street turning their necks to the point of dislocation to look at my stroller, etc. Also, they are OBSESSED with mixed race babies. I should write a post about that. Sounded like a quiet one and hope no one else apart from the three of you got it! Chinese New Year here for my family in Australia was a quirt affair…just a dinner and passing around of red packets 😆 Nothing extreme like eat, eat and eat. Unlike! No more baby colds! Unless it makes him stronger…Does it make his immune system stronger? Yes, I think it works like that, haha. Uuuh, traditional characters, hehe. 新年快乐 to you too! I normally always go travelling but this year with the baby we decided to take it easy! Haha that’s a lot of weight for only one week! The scale tells me I didn’t gain anything but I feel very flabby anyway. I love your family photo. What a good looking family! And I love the pond where the giant turtles lived. 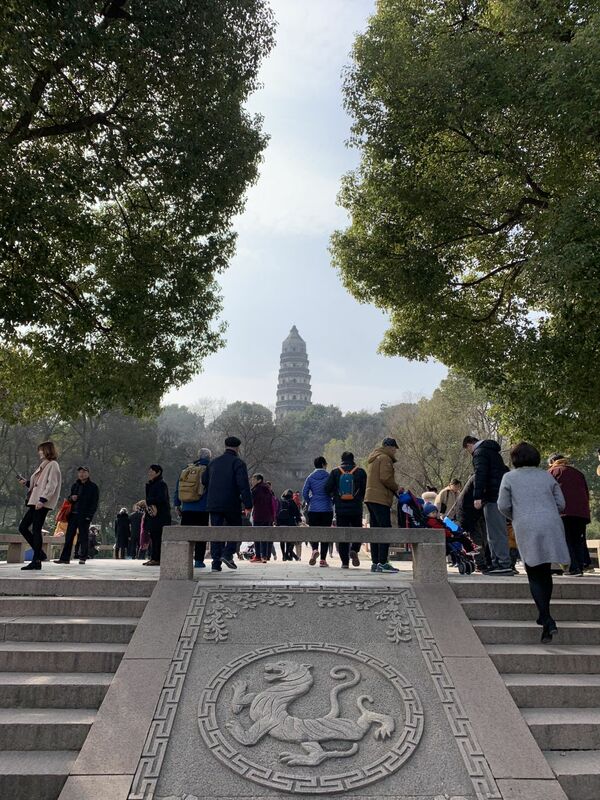 Suzhou is such a beautiful city. It’s always fun to have your baby admired, especially when he’s a friendly, good natured baby. I don’t mind family and friends admiring him but I’m a bit worried about the random strangers… I wonder if he will feel different and left apart when he is old enough to understand the people calling him “foreign doll” and things like that. Nice to hear what you did Marta but shame you all now have a cold. I hung out two Chinese lanterns and gave red envelopes to my two dear friends. Nothing exciting however. That’s good enough, hehe! Will you eat tang yuan next Tuesday (Lantern Festival)? I do love them but not sure where to get them here. Now you have mentioned them I need to find out where they are. They should have the frozen ones in Chinese supermarkets! Oh, no!! I hate gambling, haha. I only want to play for fun (and if there’s money involved then it’s no fun for me). There is money involved but it all stays in the family 😉 I had fun! Happy Chinese Luna New Year! Nice post and photos. 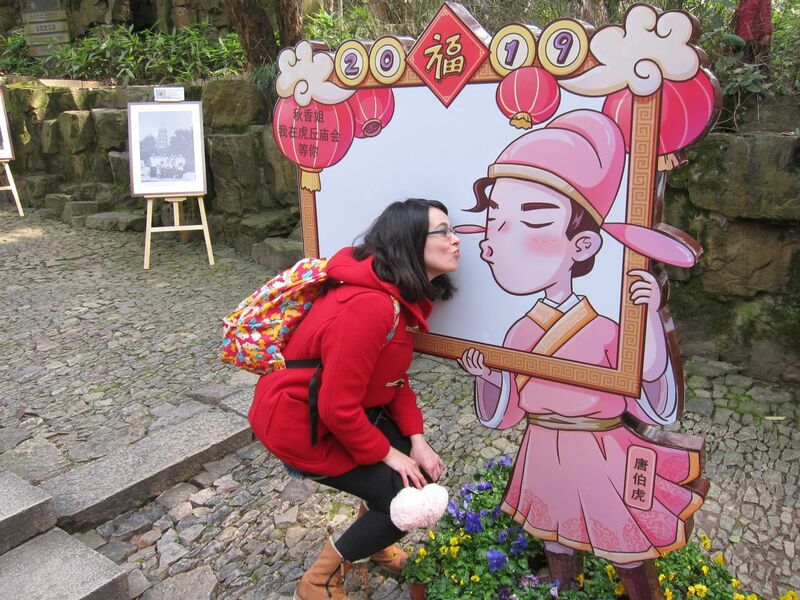 It’s surprising this was your first Lunar New Year in Suzhou but I guess you’d usually visit Spain or go on holiday right. It’s good you and your family got to go out and around.